Afghanistan. Syakamarak village. Cemetry. Front Attalullah and Rabia ,behind Zamen and Elia Ahmad ,with members of the community praying at the graves of their dead babies. Vicctims of poverty and poor harvests. Afghanistan. Kabul. District 7. Technicum area. Aqela. Widow. 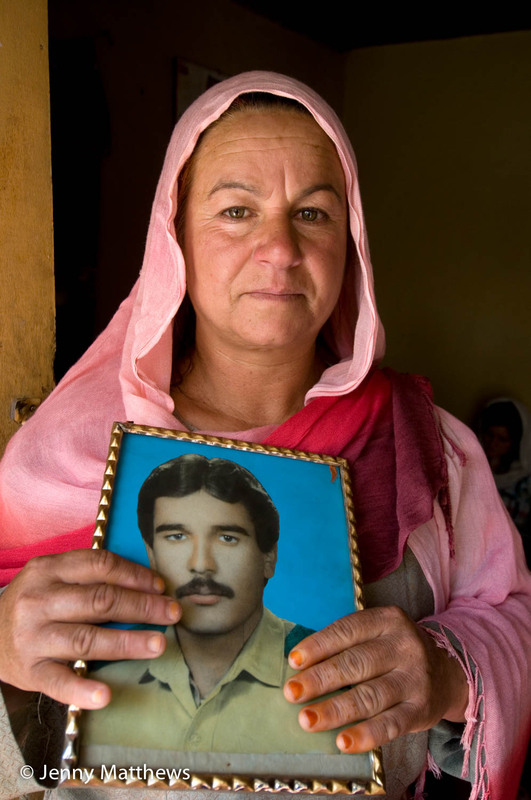 'Twenty years ago, in Najibullah’s time, my husband, Amachan, was killed. I was married when I was 18 (it was an arranged marriage ) and we had 9 years together, and I had 4 children with him. My husband was an engineer but he had to do military service and that was when he was killed when there was fighting with the Mujaheddin'. Afghanistan, Kabul. Hawca safe shelter for women. Angiza, 18 (not her real name), victim of domestic abuse. Afghanistan. Herat. Shelter for young women, victims of abuse. August 2009 Afghanistan. Truck with loveheart decoration. Kabul, Afghanistan 1996. Razia and her wedding photo. Her husband disappeared 4 years ago. 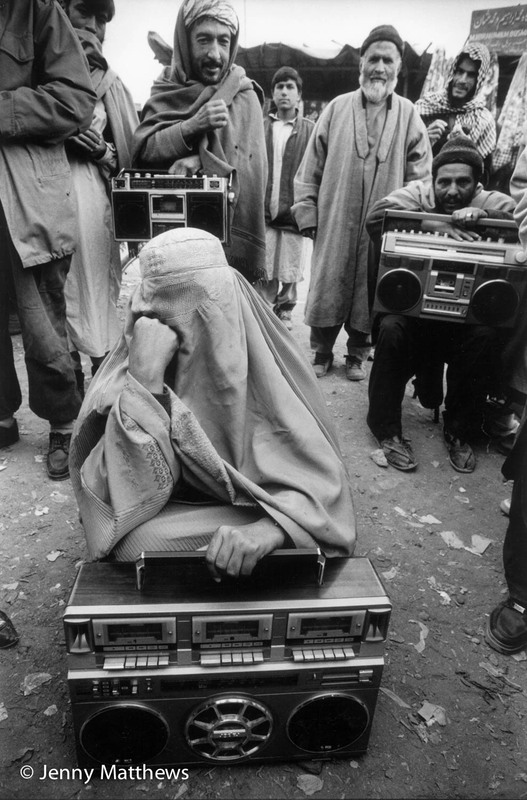 Kabul, Afghanistan, 2nd December 2001. In the rambling city market people bring odd possessions to try to sell and raise enough cash to get through another week. Market business is traditionally done by men, widows have no choice but to take their place alongside them. San Salvador, El Salvador 1982. 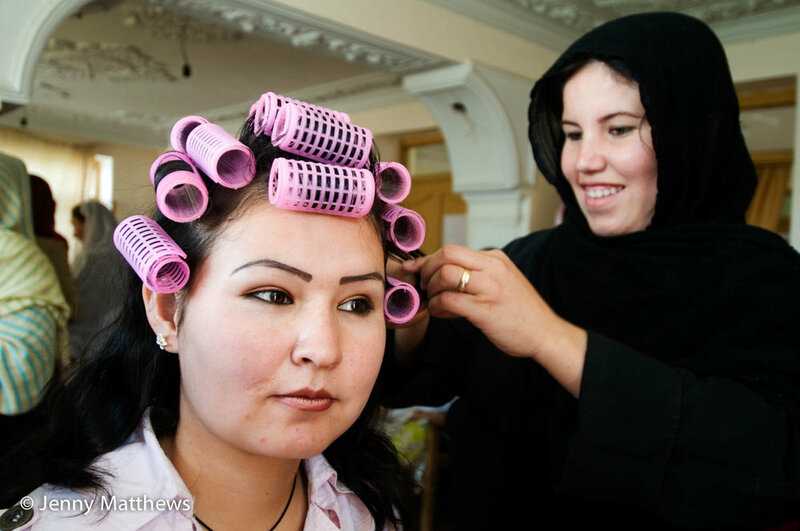 Displaced women learn to read & write for the first time in a safe refuge. 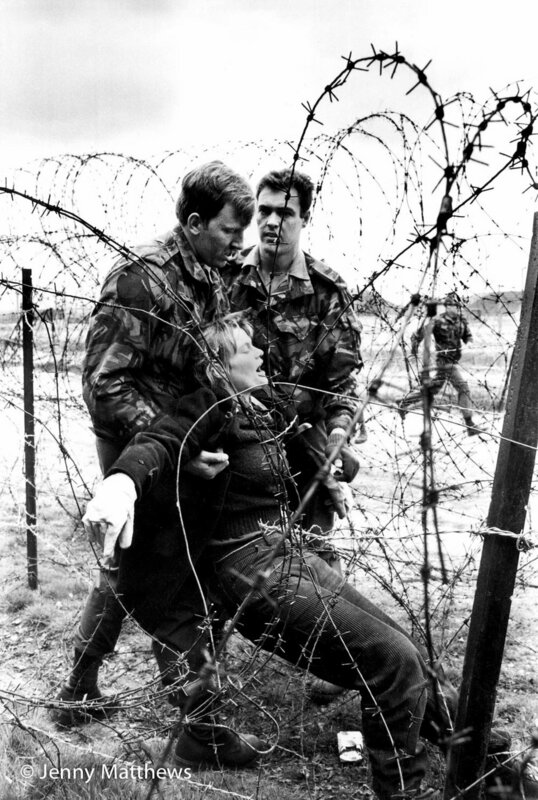 Greenham Common May 12th 1984. Rebecca Johnson, protester and peace activist, arrested after cutting fence of US cruise missile base. Eritrea 1988. Lemlem, an EPLF fighter who had just taken part in the battle of Afabet. Gaza Thursday April 21st 1988, 40th anniversary of State of Israel and four months into the (First ) Intifada. People are angry and frustrated . Managua, Nicaragua 1984. 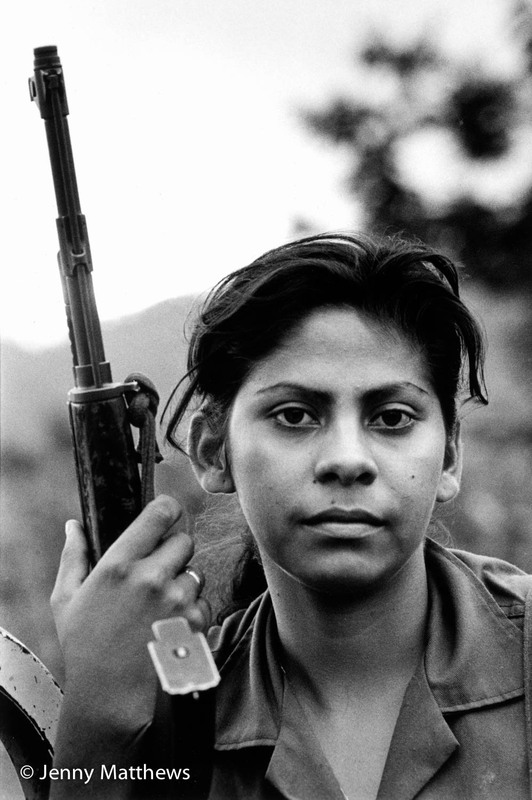 Martha Lorena on guard duty outside the main telecommunications office, prepared for an attack by the contras..
Ajiep camp, South Sudan 1st August 1998. 18 year old Ayak Agau cries at the burial of her daughter who died of hunger. 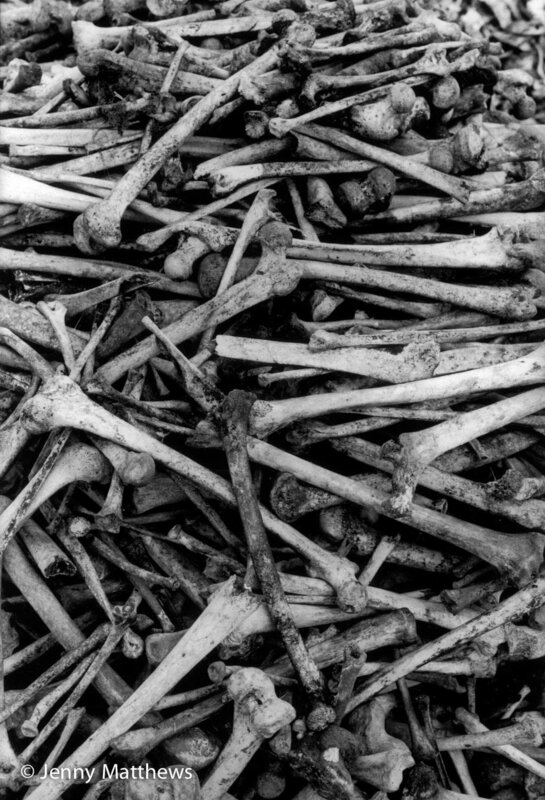 Gisenyi, Rwanda border, July 20th 1994, a pile of arms taken off the fleeing killers as they crossed into Zaire . There are guns from the Hutu soldiers , but also a mass of machetes, knives, pounders , and assorted agricultural implements used by ordinary villagers to kill their ordinary neighbours . Bisesero, Rwanda , May 14th 1996. Most of the men and all the women of the village were killed, a couple hundred of the 800,000 victims of the genocide . Butare, Rwanda Monday 18th December 1995. 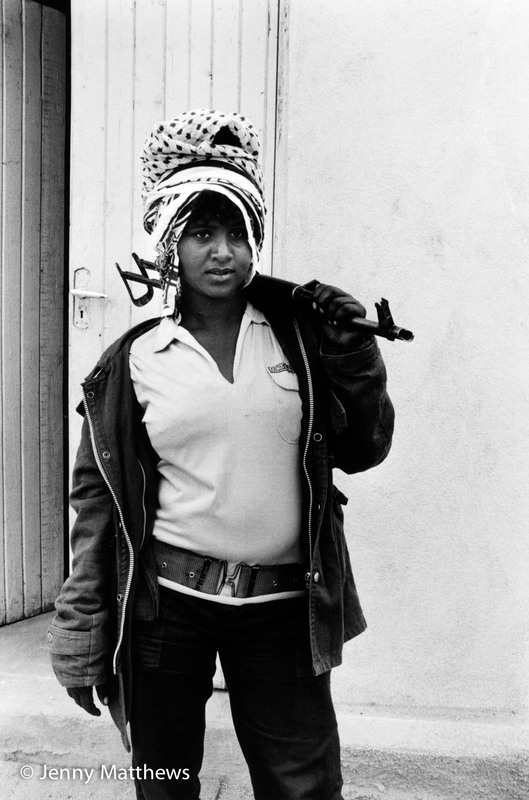 During the genocide Consolée Mukakalisa put her hands up to protect her face and was mutilated. Rwanda, Butare. 2014. Now 41 , Consoleée is married to Paul (who married her in spite of his family and community trying to persuade him not to), she has three children of her own(the eldest is at boarding school), and cares for her nephew. She went to Switzerland and one of her stumps was divided so she can pick up things. London. 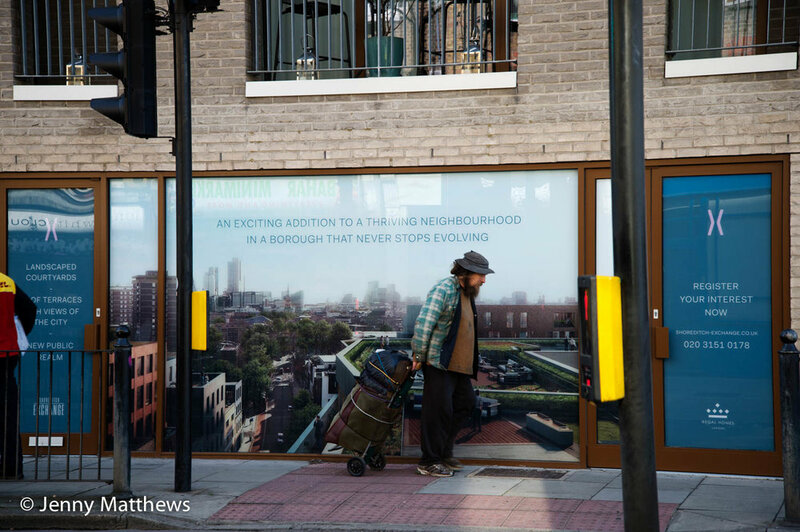 A homeless man passes Shoreditch Exchange on Hackney Road, a new luxury housing development being sold with the message 'An exciting addition to a thriving neighbourhood in a borough that never stops evolving'. Hackney, London July 2011. Shoreditch festival. A couple in a rubber dinghy in the rain, shelter under umbrellas, adrift on the Regent's canal in the rain. Picketing of Hackney bus garage during a strike by bus crews, members of Unite trade union. The 38 bus goes from Hackney Wick through central London to Victoria. Mecca Bingo Hall on the Hackney Road (now closed and being redeveloped as luxury flats). London 2005. Two young Muslim women take part in a demonstration in Trafalgar Square after the London bombings of July 7th. France, Calais. 'Jungle' camp for refugees. An Iraqi Kurdish family, working in front of their caravan home. Hungary, Budapest, Keleti Station where refugees wait for trains to Austria and Germany. The mobile phone charging and internet facility provided by Greenpeace Hungary. France, Calais. 'Jungle' camp for refugees. Abandonned soggy snowsuits in a ditch. Beslan, North Ossetia. 2005. 1st anniversary of massacre in school. RUSSIA Beslan, North Ossetia A mothers committee hold a meeting at the gym where bombing took place during the Beslan school siege of 2004. 330 people died in the shootout between Russian security forces and Chechen rebels which took place in Beslan's Middle School Number One after it was seized by terrorists in September 2004. The gym is now a shrine to those who died there. France, Calais. 'Jungle' camp for refugees. An umbrella is abandonned caked in mud. Calais. 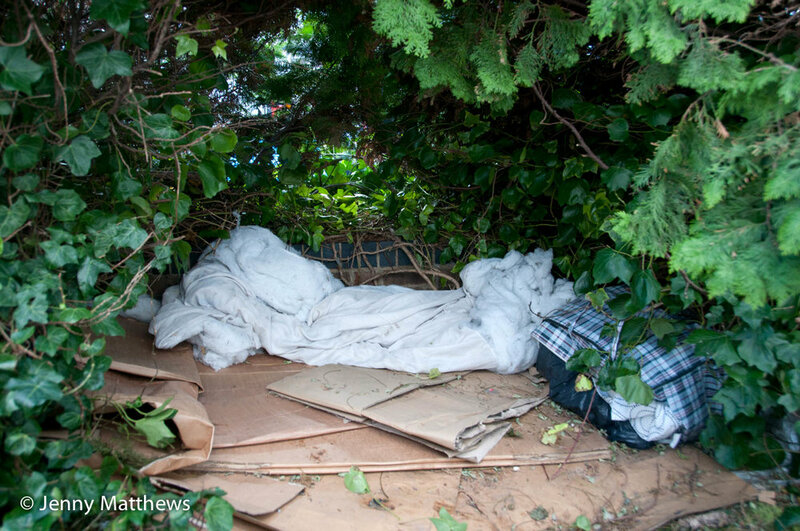 The 'Jungle', home to thousands of migrants, fleeing war, poverty and lack of opportunity. A shelter with shaving mirror, toothbrush and comb. Gaza. Jebel Rayas area , Jabalya. 2009. A Palestinian woman next to the remains of an ancient olive tree, cut down by the Israeli army. Idomeni, border crossing between Greece and Macedonia (Fyrom). Refugees come on buses from Athens (costs 20 euros). Razor wire coils mark the border. Suddenly it was closed trapping thousands in pouring rain. Alexandria, Egypt. Young women chat and lick lollipops. Jordan. Amman. Syrian refugees. Thursday April 18th 2013. 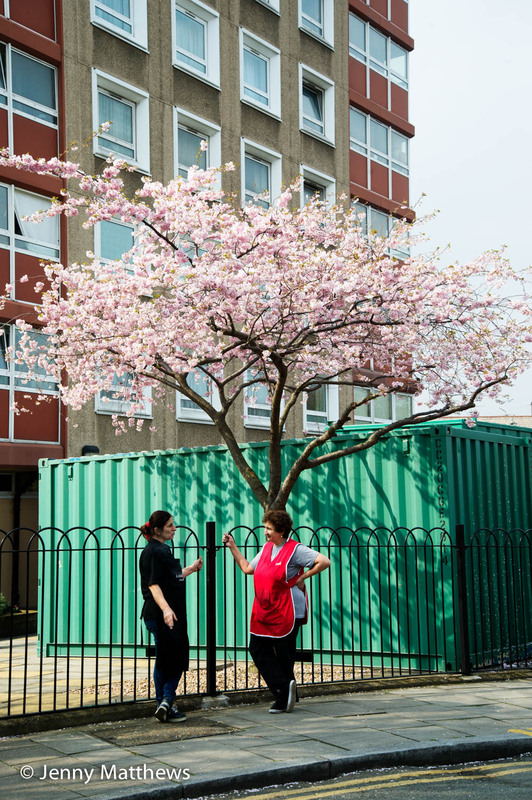 Muna, 65 – living alone “All the things in this house are from the neighbours. My daughter is in Amman with her family as refugees but her husband doesn’t want me to stay with them. 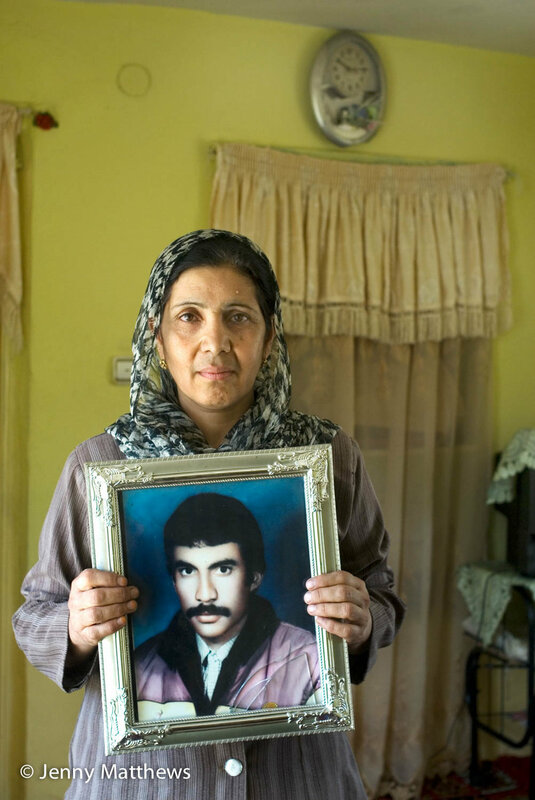 My two sons are still in Syria.My husband died 10 years ago." France , Calais, camp for refugees known as 'The Jungle'. September 21st 2015. French police oversee the removal of the tents and belongings in them, from under the flyover at the edge of the camp. A young Eritrean woman asks to retrieve her papers but her request falls on deaf ears. PAKISTAN A child reads at a community school run by Khwendo Kor in Walaki Mahabatt village. Khwendo Kor is an NGO working specifically for the empowerment of women and children in Pakistan's deeply conservative North West Frontier Province (NWFP).